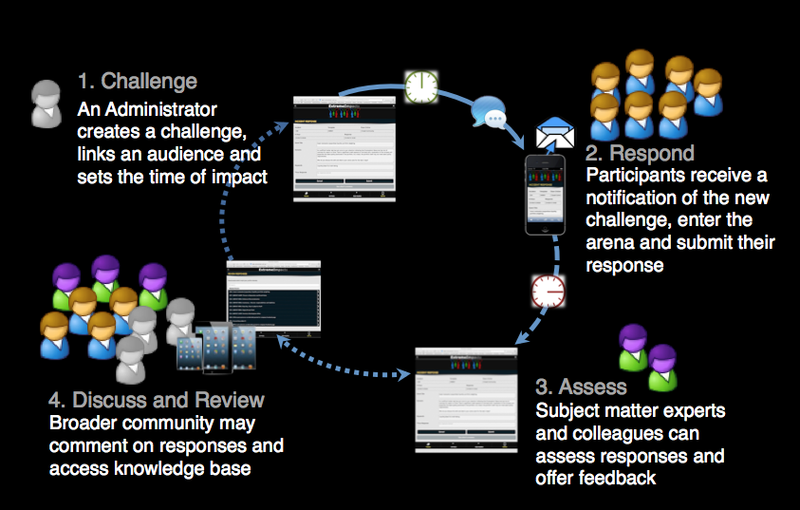 The Challenges Platform provides a complete on-line environment supporting an eco-system of secure organisational arenas and audiences comprising of participants, experts, administrators and value adding service providers. Participants can belong to multiple audiences and be a member of any number of arenas, supporting individual capability development across professional and personal areas of interest. Organisations host arenas and manage their own audiences and challenge communities to ensure that content remains relevant, secure and only accessible by the intended audience members. Collaboration can take place at the level of individual interactions with mentors, between select team members who may be impacted by a scenario, in a broader audience or across the whole arena. Challenge content can include video, audio, text, and images in order to draw the respondent into a scenario, engage their emotions and reflect on the thinking behind their decisions. The platform is available as a subscription service and is accessible globally over the internet using any popular smart phone, tablet or desktop computer browser. The network consists of a number of on-line arena forums. Each arena has a unique, branded, internet address and can be customised with an individual style. Arena administrators manage membership registrations, audiences, challenges and the response knowledge base. Once someone joins the network, they can be invited to register in any arena. 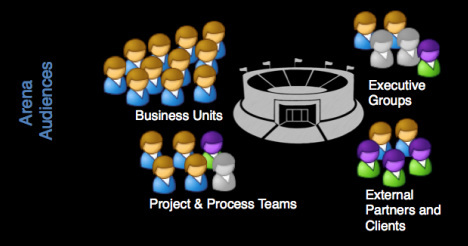 Each arena can host a number of different audiences and each arena member can belong to any number of audiences. Challenges can be issued to an audience or selected individual arena members. Responses can be restricted to individual, challenge group, audience or arena wide access. Impact Challenges follow a virtuous cycle of experiential learning from inception to insight with feedback leading to continuous development. Workflow is automatically provided to facilitate the collection and collation of responses within an evolving knowledge base. Social 'crowd sourced' solutions can be blended with expert mentoring and decisions guided by policy to maximise the potential of groups. Experiences gained using the platform can be shared with other learning and development solutions via the industry standard Advanced Distributed Learning Experience API (also known as the Tin Can API) where Impact Challenges can act as an Activity Provider. For a more comprehensive solution, the Platform can be used in association with other learning and development services including certification, course and skills assessment from XEN Connect.